Both pitchers seemed headed for Class AAA Tacoma to start the season, but with Erasmo Ramirez's status uncertain, they will vie for that open spot in the rotation. PEORIA, Ariz. — It wasn’t until the last few weeks of spring training in 2017 where the premise of the projected starting rotation was thrown into chaos by the “soggy” left arm of Drew Smyly. And that expected group of five starters were never once together during the regular season. Heck, at times, the Mariners only had one of the five not injured — Yovani Gallardo — and he was their worst performer. 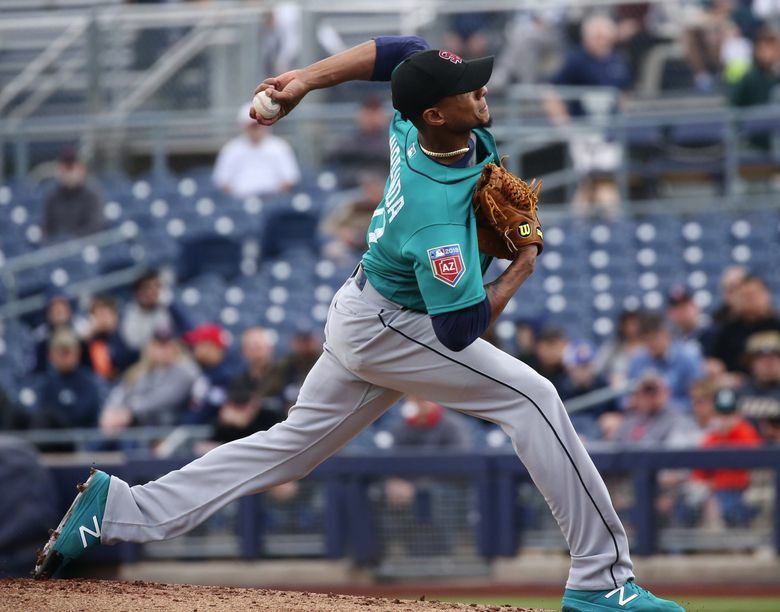 The Mariners made it exactly three days into camp before their expected rotation needed editing when Erasmo Ramirez started feeling tightness in his latissimus dorsi (lat muscle) and was shut down from throwing for two weeks. 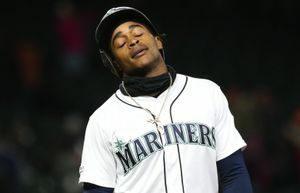 While there is some hope that Ramirez could be ready to go when needed at the start of the season, aided by an April schedule field with off days, when exactly have the Mariners had recent luck with starting pitchers returning as expected? It’s prudent to plan for the possibility that Ramirez’s injury follows the more typical path of lat strains, which is a six-week recovery to full strength. It’s why the two top candidates to replace him — left-hander Ariel Miranda and right-hander Andrew Moore — pitched two innings each in Friday’s Cactus League opener. On the organizational depth chart for starting pitchers, Miranda and Moore sit sixth and seventh. Both seemed headed for Class AAA Tacoma to start the season, but with Ramirez’s status uncertain, they will vie for that open spot in the rotation. Not much could be gleaned from their work in a 3-2 win against the Padres. Miranda started the game and was a little shaky with his command early, walking the first batter of the game and later allowing a run in the first inning. He worked out of the trouble, aided by nice diving catch from Ben Gamel and timely 5-4-3 double play. Moore pitched two scoreless innings, not allowing a hit with a walk, a hit by pitch and three strikeouts. 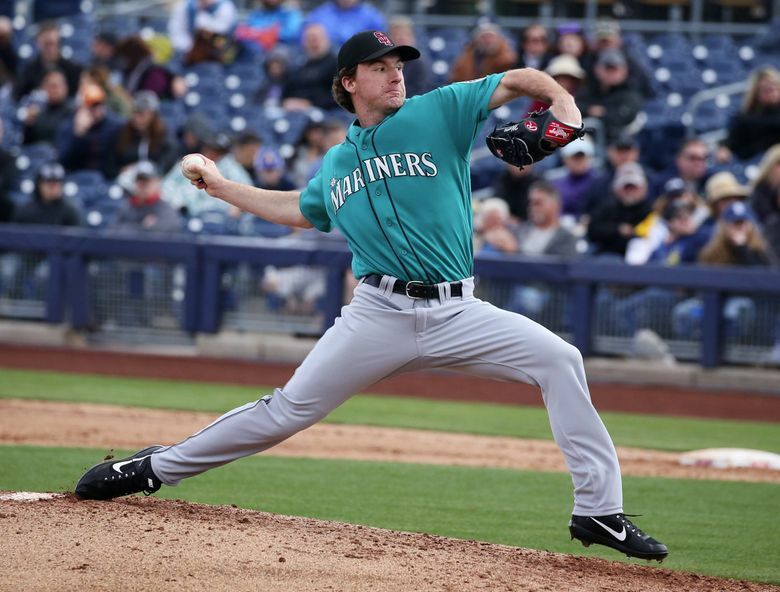 Expected to be in Tacoma to start 2017, Miranda moved into the rotation when Smyly was injured after pitching in the World Baseball Classic. He was solid to start the season, but struggled in the season’s final three months, eventually being demoted to the bullpen. He posted a 7-4 record with a 3.82 ERA in first 17 starts. But he was just 1-3 with a 6.71 ERA in his final 12 starts while allowing a whopping .905 on-base plus slugging percentage and 17 homers. For the season, Miranda gave up 37 homers, second most in all of baseball. There was some belief that Miranda was tipping his pitches and teams could differentiate his pitches from his windup, which led to all the homers and extra-base hits. Servais wouldn’t use it as a complete excuse for it. Beyond tipping pitch to pitch, hitters also know that Miranda has been essentially a two-pitch pitcher for his career — fastball and changeup. He’s never had much of a breaking ball to speak of. It’s certainly not a pitch that hitters feared. 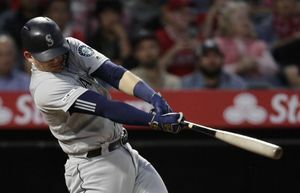 The Mariners admit that Moore was rushed to the big leagues because of the rash of injuries to the rotation. He made his big league debut on June 22, picking up the win against the Tigers. His produced quality starts in his first three outings. But that success was short-lived. Teams adjusted to him and he posted a 6.16 ERA in his final eight outings — six starts and two relief appearances. Moore admitted to searching at times in 2017. His arm slot was so inconsistent it made his pitches lose life and movement. That’s not ideal for a command pitcher that lacks overpowering stuff. Moore will also re-focus on his changeup instead of trying to force breaking pitches to be his strength.